The favorite Saint of the Christmas season is a year-round resident of our city, with two churches, icons and stained glass windows honoring him. “Well, you don’t really see another Saint pictured with a money bag…” Deacon Gregory Haddad, from Houma, spoke with a soft Cajun accent as he explained why a small stained glass window could be identified with St. Nicholas, even without a nameplate. The money bag refers to the miracle of St. Nicholas anonymously providing dowries to poor girls, so they could marry. The window was displayed inside the sanctuary of the St. Nicholas of Myra Byzantine Catholic Mission on Carrollton Avenue just off Claiborne. There was also a large icon of the Saint, as well as a small, older icon of him. St. Nicholas was a Bishop of Myra, once a Greek settlement but now located in Turkey, in the fourth century. His bones were taken to Bari, Italy, in the eleventh century. By that time he was already venerated in Germany and was a well-known Saint throughout Europe. Father George Wilson of the Holy Trinity Greek Orthodox Cathedral in New Orleans noted that the story of St. Nicholas is part of children’s religious instruction. Not only did St. Nicholas give dowries to the poor girls, he did it anonymously, throwing bags of coins in the window. Only when the family hid to see their benefactor did they learn it was the kindly bishop. 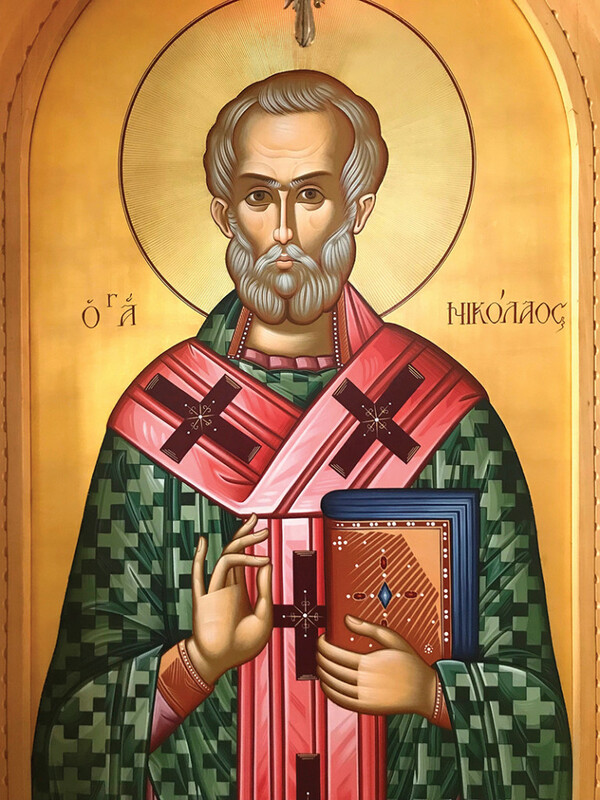 The Greek Orthodox Cathedral’s icon of St. Nicholas was painted by Iconographer Laurence Manos, who studied iconography at the Mt. Athos Spiritual Center in Greece, and donated by Spiron & Sandy Bouzon and family. The St. Nicholas window is closest to the altar on the right hand side as you enter the sanctuary. The lower half of the window appears to picture Jesus teaching in the temple as a boy. The upper half has St. Nicholas as a bishop. Pictured with him are three little children peering over the edge of a wooden barrel. St. Nicholas performed a miracle when an evil butcher had chopped up the children and put them in a pickle barrel. When the Saint appeared before him, the butcher confessed and repented. St. Nicholas restored the children, whole again, to life. St. Nicholas’ feast day is December 6, when children traditionally set out their shoes for him to fill with gifts. In the Netherlands, he traditionally rides a white horse. In America, of course, St. Nicholas is still with us, somewhere in the background of Santa Claus. Best of all, he still brings gifts.